NO FLOOD THREAT IS FORECAST. Subtle changes to the environment compared to yesterday will bring slight changes to the forecast, but no flood threat will unfold. 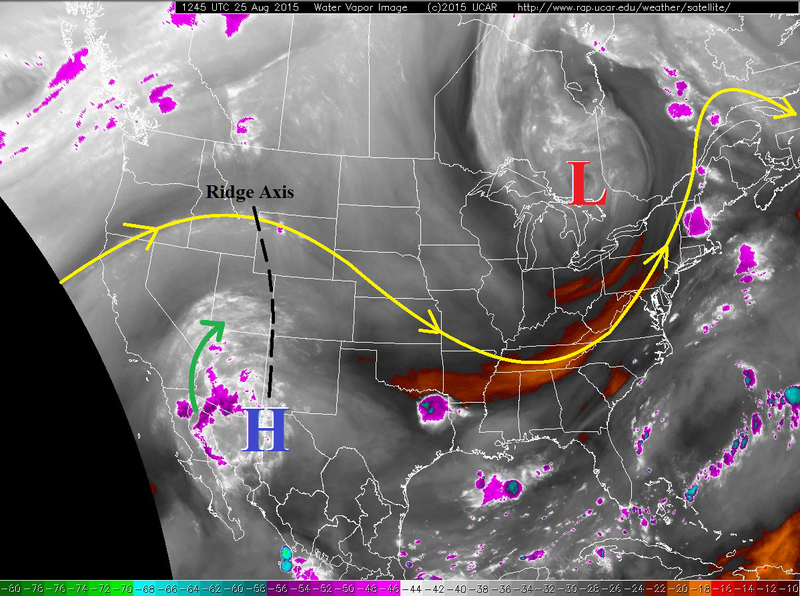 The mid-/upper-level ridge axis, depicted on the water vapor imagery below, will shift slightly eastward, allowing a bit more moisture to make its way into Colorado this afternoon and evening. The moisture will bring a slight uptick in thunderstorm activity over/near the mountains, including the Urban Corridor and Palmer Ridge regions. The Northeast and Southeast Plains will hold a low possibility for isolated thunderstorms, with chances diminishing from west to east. Overall, most showers and thunderstorms will be of the garden variety. Scattered coverage is expected across the Central Mountains, Southwest Slope, San Juan Mountains, Grand Valley, and Southeast Mountains regions, with more isolated coverage over the Northern Mountains, Northwest Slope, and Front Range. The San Luis Valley should stay dry, with the surrounding mountains experiencing scattered showers/thunderstorms. Further east, the Urban Corridor, western portions of the Southeast Plains, and Palmer Ridge should see a couple isolated thunderstorms move overhead, with the best relative chances over the Palmer Ridge. Outflow boundaries from mountain convection will try and force development of an isolated thunderstorm or two further east over the Plains regions, but will struggle to do so with mid-level temperatures being difficult to overcome. Activity will tend to diminish after sunset, especially for low elevations, but a few mountain showers/thunderstorms will remain through the night as moisture continues to be transported into Colorado from the west/southwest. Isolated thunderstorms expected this afternoon and evening, with the best chances near the mountains and over preferred terrain of the Palmer Ridge. Gusty outflow winds and lightning will be the main threats, but localized, brief, moderate-to-heavy rainfall will be possible. Otherwise, mostly sunny skies and warm temperatures will be experienced. Isolated showers/thunderstorms expected, with the best relative chances across the Front Range. Gusty outflow winds, light rain, and lightning will be the main threats, but localized, brief moderate rainfall will be possible across southern portions of the Front Range. Rain rates will general be 0.15-0.35 inches/hour, but a strong storm over the southern Front Range could drop 0.5-0.8 inches/hour. Scattered showers and thunderstorms expected over/near the mountains. Lower valleys will stay mainly dry, with only a couple isolated storms drifting off the mountains and overhead. Activity will begin to increase shortly after 11 AM, and continue into the overnight hours across the mountains where moisture continues to increase from the west-southwest. Localized brief moderate-to-heavy rainfall will be possible with stronger thunderstorms across the Southwest Slope and San Juan Mountains, but storm motions will be quick/erratic enough to mitigate any potential flood threat. Near bank-full conditions may be found in smaller streams in those regions, but flash flooding is not expected. The flash flood threat will increase tomorrow as moisture continues to uptick and the additional support of a shortwave disturbance is expected. Timing: 11 AM – 11 PM, with a few showers and thunderstorms continuing overnight and into tomorrow morning across the southwestern quadrant of Colorado.